Manage multiple audio sources and sets of monitor speakers, track using illegally loud headphone amplifiers and so much more! This professional desktop studio-control system manages three stereo line-level sources, a stereo S/PDIF digital input, three sets of monitors, and four sets of headphones. Quickly and easily audition multiple stereo sources and switch between three sets of reference monitors, all from your desktop. Monitor Station has made switching between monitors so easy, and added feature of being able to talkback right through this interface is amazing! Make working in the studio such an enjoyable and effective experience for myself and clients. I had some issues with a previous monitor station that was make static noise and messed with my recordings .which caused me to buy this baby!! 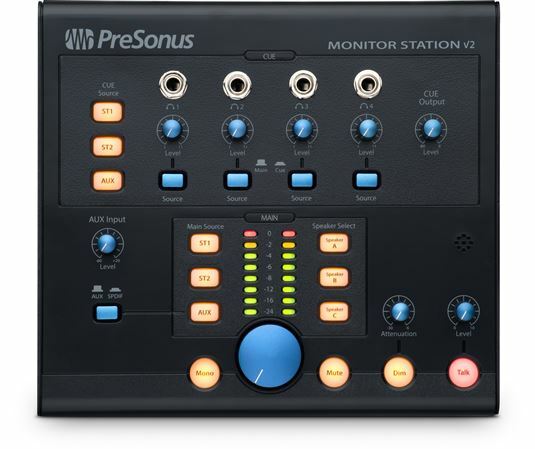 I am truly enjoying the presonus monitor station . I’m able to hook up two set of monitors and a subwoofer. I like the simplicity of everything . Its easy to operate. This piece is definitely something everyone one should have in their studio especially many engineers with multiple Monitors and headphones! Use this with my Yahama's (to mix) and my KRK's (to reference) Well worth the money! Wanted for a while. So glad I picked this up. Helps a lot. Had the previous model. This by far a great improvement in the product. No coloration at a good price. Yeah, these just do what we need them to do, and unlike other products in this price range this one doesn't seem to degrade or color the signal. This is what I needed for my up and coming home studio. It gives me total control of my sound sources and offers extras it has a lot bells and whistles well worth it.